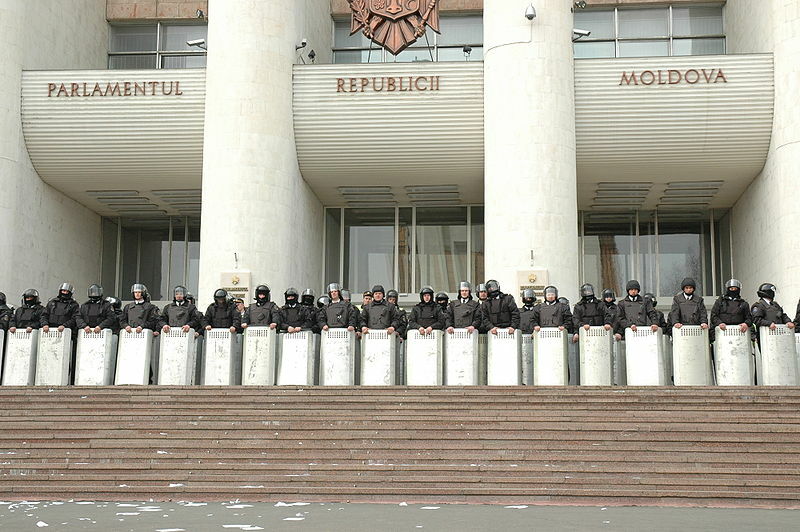 You can find the latest on the progress of the dispute over Moldova’s election over at Reuters and the BBC. The government has agreed to recount the votes from the elections on 5 April. Opposition parties say this course of action takes no account of their concerns over fradulent voter lists. They are also worried that a recount might be used to get the Communist Party an extra seat in Parliament, allowing President Vladimir Voronin’s successor to be elected unopposed. In the meantime, here are three updates on the rather less important Twitter angle. In a piece in The Guardian, Natalia Morar, one of the organisers of the protest last Tuesday, says Twitter was used to help organise the initial flash mob. "We decided to organise a flash mob for the same day using Twitter, as well as networking sites and SMS…Not only did we underestimate the power of Twitter and the internet, we also underestimated the explosive anger among young people at the government’s policies and electoral fraud". I think it had already been established that Twitter was involved given the commenters on this blog and the establishment of the pman hashtag. Although I am somewhat intrigued as to why Twitter doesn’t seem to get a mention on Morar’s blog by name on the 7th April (neither here nor later) given what she says about Twitter to The Guardian. Perhaps she is aware that the Twitter angle is helping to keep Moldova in the news? Perhaps The Guardian went in with the intention of getting a quote on Twitter? In any case, in this interview she still backs up my point that this wasn’t just about Twitter as certain news articles implied. And it hardly needs mentioning that the "the explosive anger among young people at the government’s policies and electoral fraud" might have something to do with all of this. Ethan Zuckerman has done some excellent work looking at some of the data from #pman. I agree with Ethan that more quantitative work needs to be done in this area. I often think that it must be possible for somebody to programme far more useful Twitter analytics software than we currently have available. What I would guard against is the temptation just to look at Twitter because in theory it’s relatively easy to access. Although it might be more difficult to look at blogs, forums and social networking sites in this way, I think researchers should nevertheless be attempting to pull out examples of the interactive nature of social media. For example, it would be really useful for someone to see how this played out on blogosfera.md and Odnoklassniki. Evgeny wrote a post saying that the Twitter revolution is not a myth. Although I have to say I think we’re looking at Twitter’s role from different angles rather than being diametrically opposed. Here’s a good example first up. "But to prioritize the internal organizational elements of this story is to entirely miss out on the crucial role that Twitter played in mobilizing the masses outside of and far away from the square (and, in part, getting some of them TO the square in the first place). I can think of many situations, in which what is happening outside — and especially what is being discussed outside — is far more important than what is happening inside the rioting crowds." "Yes, as Daniel Bennett points out in his critique, Twitter may not have played a role in coordinating events in the square. But there was NO coordination in that square – all reports look like it was total chaos and anarchy. With or without Twitter, there was nothing to organize as the genuine political agenda seemed to be amiss." But Evgeny’s emphasis in the original quote was on the way Twitter was used to mobilise awareness and support both within and outside Moldova. I don’t think you can fault his conclusions with regard to the way Twitter enables the thoughts of a few to be disseminated far more widely and the potential impact that has on coverage of the event. "Perhaps, the biggest fallacy committed by the critics of my "Twitter revolution" thesis has been to assume that Twitter exists in some sort of isolated environment that is easily quantifiable and shut off from other media platforms. It’s this kind of assumption that leads them to conclude that "few Twitter accounts=few reasons for the Twitter revolution to happen." One of my main points was that this was about social media more widely and not just about Twitter. ("I would suggest this was a much wider social media campaign.") I agree it’s possible that tweets might have a wider life than on Twitter and I’m sure they do, but if they do we should be able to find some examples which might be worth bringing to the debate. (You might also argue it the other way and say that blogs have a wider life than just being on a blog because they can be fed through Twitter/Facebook/forums etc). e sites were following the #pman hashtag and not having Twitter embedded on blogs might not mean that much.